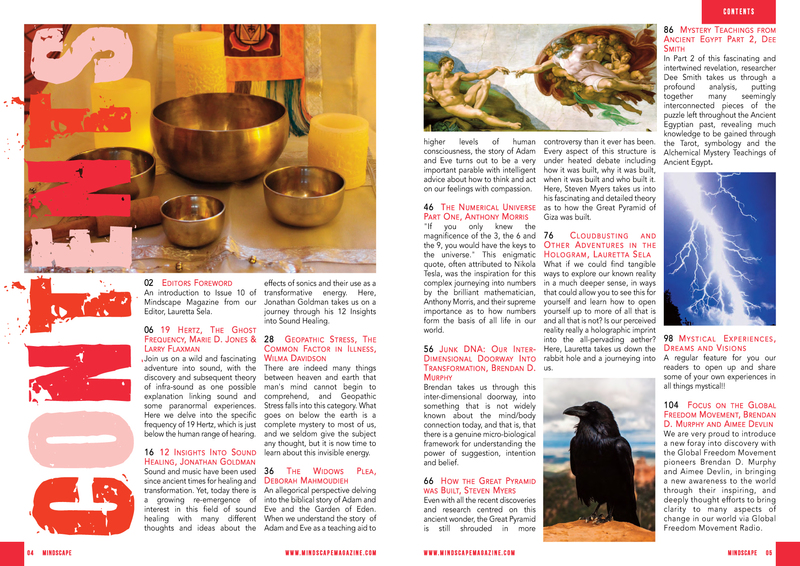 In this issue, we explore the frontiers of the mind, science, mathematics, history, sound and frequency in their myriad expressions in vibration and form. With fascinating insights into the many varied aspects of sound and frequency – the invisible and sometimes unheard component of life that unknowingly affects us all in our daily lives – sound, is thought to be the first emanation of life! In this issue we take an in-depth look into how sound, frequency and vibration affects us, and how it impacts on the human EM field. Sound and music have been used since ancient times for healing and transformation, and author, musician and teacher in the fields of Harmonics and Sound Healing, Jonathan Goldman, who in 2011 was listed by the Watkins Review as one of the 100 most spiritually influential people in the world, takes us through his vast understandings into sound with his 12 Insights into Sound Healing. We are also very pleased to announce that we are introducing a new feature of audio/sound files within our authors’ articles for you to gain a deeper perspective and meaning from their work within our magazine offering a more interactive experience, which we are sure you will enjoy!